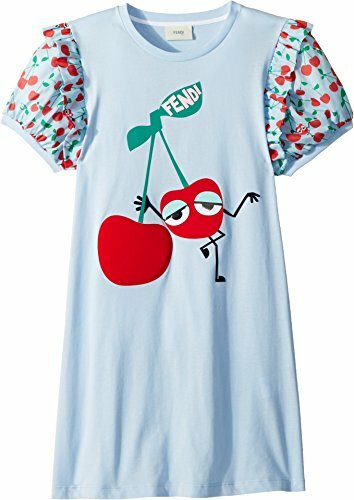 Her true beauty is as sweet as this Fendi Kids® Cherry Graphic T-Shirt. Banded, jewel neck tee. Relaxed fit with hip length. Short, cherry print sleeves with ruffle accent. Sassy cherry graphic print along the front. Pullover design. Straight hemline. 100% cotton. Machine wash cold, tumble dry low. Made in Italy. This item may ship with an attached security tag. Merchandise returned without the original security tag attached or a damaged tag may not qualify for a refund. Measurements: Length: 29 in Product measurements were taken using size 12 Plus Years. Please note that measurements may vary by size. Her true beauty is as sweet as this Fendi Kids® Cherry Graphic T-Shirt. Short, cherry print sleeves with ruffle accent. Sassy cherry graphic print along the front. Pullover design. Straight hemline. 100% cotton. Machine wash cold, tumble dry low. Made in Italy. This item may ship with an attached security tag. Merchandise returned without the original security tag attached or a damaged tag may not qualify for a refund. Measurements: Length: 29 in Product measurements were taken using size 12 Plus Years. Please note that measurements may vary by size. If you have any questions about this product by Fendi Kids, contact us by completing and submitting the form below. If you are looking for a specif part number, please include it with your message.